Anyone really understand this ? Maybe some of you can make sense of this ,,, I'm travelling to the U.K. this Friday on a family matter. My schedule is to leave Kelowna on the 11th. and return on the 17th. Because there is no direct flights to my destination with transfer time I'm looking at around sixteen hours. Yesterday the return airfare with KLM was $ 1877.35 including seat selection with 103 available seats. Today the same flight is $ 2341.25 including seat selection with 93 seats available for Friday evening's flight to Amsterdam. Does anyone else think " there's something wrong with this picture ". When we checked with one of the other major airlines their fare from Kelowna to my destination was a bit better, but on the return trip there was a 21 hour stopover in Dublin. I guess I'll just bite the bullet so to speak and pay what I have to ,,, but it really just doesn't make much sense when there is so many vacant seats on the aircraft. Re: Anyone really understand this ? buteman wrote: Maybe some of you can make sense of this ,,, I'm travelling to the U.K. this Friday on a family matter. My schedule is to leave Kelowna on the 11th. and return on the 17th. Because there is no direct flights to my destination with transfer time I'm looking at around sixteen hours. buteman wrote: Yesterday the return airfare with KLM was $ 1877.35 including seat selection with 103 available seats. Today the same flight is $ 2341.25 including seat selection with 93 seats available for Friday evening's flight to Amsterdam. Does anyone else think " there's something wrong with this picture ". Not at all, fewer seats and price goes up. Airline economics is a bit more complicated than opening up a corner store. what I have to ,,, but it really just doesn't make much sense when there is so many vacant seats on the aircraft. Not sure what destination in the UK you're travelling to, but fares for those dates from YLW to LHR/LGW are available for just over $900 CAD taxes in. But what is it exactly your not understanding? 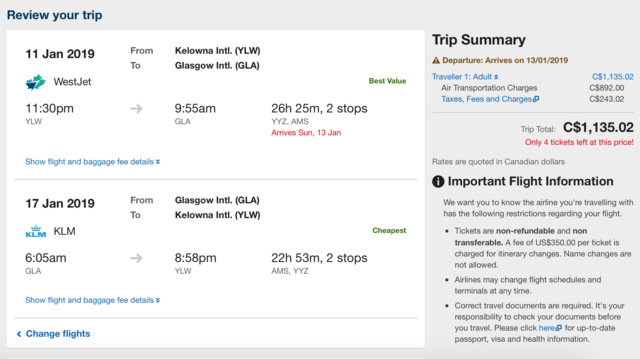 You must know something we don't know ,,,, not a chance a return fare from Kelowna to our destination ( Glasgow ) is $ 900.00 taxes in ,,, you might be lucky and book that flight at that price, it's a very good price but it sure as heck isn't round trip !! By the way ,,, to the member who posted that we could purchase a ticket from Kelowna to the U.K. for $ 900.00 taxes in ,,, please book the flight for us at that price and we will pay you a very generous booking fee ,,, thanks. buteman wrote: You must know something we don't know ,,,, not a chance a return fare from Kelowna to our destination ( Glasgow ) is $ 900.00 taxes in ,,, you might be lucky and book that flight at that price, it's a very good price but it sure as heck isn't round trip !! Did you not read my post? I specifically said that the fares I found were to LHR/LGW as you were not specific in your destination other than it being in the UK. I'm still curious as to what it is that you're not understanding? I'm trying to help you here, give you some tips to maybe help save you some money.